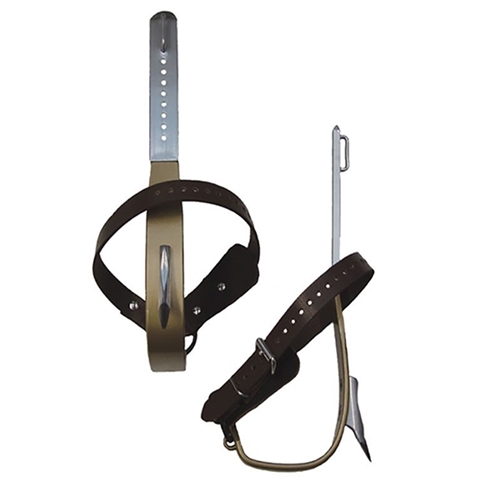 Titanium Climber, Replaceable 1-5/8" CCA Hard Pole Gaff, Contoured Shank, Offset Stirrup, 16-Degree Gaff, Nylon Foot Straps, No Top Straps or Pads. Buckingham’s gold contoured leg irons are constructed from light weight high strength Titanium. The new thicker shank design allows less flex for a more solid climb. The contoured shank is a comfort feature to reduce pressure points or chafing to your ankle bone when climbing. The shank is shaped to create a slight bow away from your ankle while the upper shank rests securely on your leg. Offset stirrups are standard on all of our climbers. Buckingham’s standard stirrup measure 4-1/2” wide for people with standard to wide feet. The stirrup is offset forward of the shank to sit closer to the center of the foot. Ankle straps are secured with a split-ring attached to a permanent eyelet on the stirrup. The gold Titanium climbers come with hard pole CCA set screw replaceable gaffs. These gaffs measure 1-3/4” with a 16 degree angle. The new placement design positions the tip of the gaff lower than previous models for working at more aggressive angles to the pole safely. Bottom straps are included. Order top straps and pads separately. Climbers are rated to 350 lbs when the user is fully outfitted with tools and equipment. Warning: Climbers are to be purchased and used by trained personnel only.